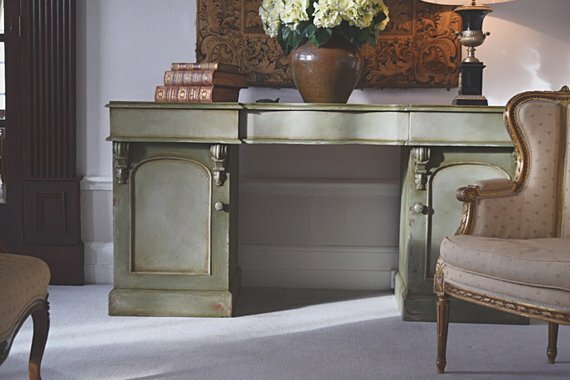 This mesmerisingly beautiful French style desk has strong ‘bones’ and great shape with panel doors and a very generous surface to make a great workspace, thanks to its secret hidden drawers either side and one in the middle. It also works as a sideboard for displaying statement pieces like neoclassical lamps or a huge vase of fresh seasonal flowers, making it great in an entrance hall or reception. I chose muted tones of Annie Sloan Olive and Chateau Grey paint to add to the natural illusion of age as if the whole piece has been faded over time using my signature soft aged look. Lightly distressed chips to the paintwork and fly speck add to a sense of a rich and varied history that really works for this elegant faded French chateau look. If you’d like to learn to paint a piece like this yourself a tutorial is available in my Painted Love Academy.